Baby Jessica is quite the little girl! 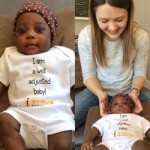 Not only did she beat the odds and show the world she’s a fighter being born at just 26 weeks, she has shown tremendous improvement with chiropractic care! Being born four months early at a mere one pound, doctors couldn’t believe she pulled through. They were unsure of many things: whether she’d ever smile, how soon she’d breathe on her own, and whether the lack of development would cause future health complications. Now, at 6-months old, she had trouble holding her head upright and was having severe reflux issues to the point of aspirating and was scheduled for a gastro-esophageal surgery later this month. We just got news from her mom that she passed her swallowing test with flying colors and showed no signs or reasoning for her surgery! Not only that, but she’s no longer arching or favoring her right side, she can hold her head up with ease and she’s even latching better while breastfeeding! 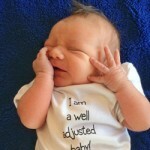 Nash wanted to tell us that he got his adjustment at just 4 days old! Chiropractic care is great for the entire family! Autism does not define Lincoln anymore! Lincoln was diagnosed with Autism and we’ll never forget the first time we met him. Sprinting through the office, throwing a fit, climbing on tables and just about anything he could reach. After his first adjustment, his mom informed us that he slept a full 10 hours that night (something he had NEVER done before), his demeanor was more calm and comfortable, and has now started taking afternoon naps. He also started stacking blocks instead of violently throwing them everywhere, he started pointing to and saying colors, and has been reaching other important developmental milestones! But do you know that best part? Lincoln’s mom says that her HOPE is restored for her baby boy again. His big sister, Addy, also gets adjusted and has noticed better sleep and improved temperament! 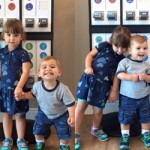 She also does such a great job helping her brother pick out stickers after their adjustments! 15-year old Josephine has some super exciting news to share! She has struggled with ear infections and fluid in her ears since she was little. She has had two sets of tubes and doctors were wanting to schedule surgery for a third set. After 2 weeks of chiropractic care, she no longer has fluid in her ears and they’ve called off the surgery! She also said she hasn’t been having migraines, has been sleeping better, and her back feels much better! Cooper loves getting adjusted! Especially now that he’s not having stomach pains and is sleeping through the night! Mom also noticed that he is not uncomfortable while on his back anymore either! 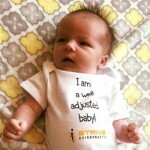 Before Sawyer started getting adjusted, he was unable to turn his head to the right and wasn’t sleeping more than a 3-4 hours at a time. Now he can turn both ways comfortably and is sleeping through the night! We’re not sure who is more excited: Sawyer or mom and dad! Kaggen came in suffering with daily headaches. After only a couple weeks of care at Strive, she hasn’t had a headache since her first adjustment and is sleeping so much better at night! 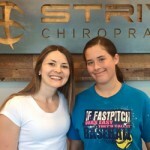 Emma has had amazing improvement all-around with chiropractic! She’s no longer dealing with chronic ear infections, she’s sleeping so much better (was only sleeping 30-45 minutes at a time), and everyone around her has been noticing a huge change in her temperament! Mom says she’s just a happier kid all around! 8 1/2 month old Blake is no longer struggling with spitting up! Mom says she can’t even remember the last time he did! 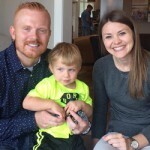 She also told us that for the first time since he was born, he’s no longer a “stuffy kid.” Last week, he started showing signs of a cold, but kicked it within a day – up until now, she said that would have normally lasted at least a week! Did you know chiropractic adjustments stimulate the nerve system which controls and improves the function of the immune system? Just one of the MANY reasons to get your kids checked! When we first met Jace, he had continuous ear infections and received multiple rounds of antibiotics, which weren’t helping. Since getting adjusted, Jace had been sleeping better and his ears are clear of infections! 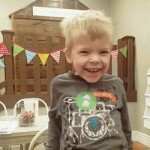 His 2 year check-up showed great ears and everyone at Jace’s house is pretty excited about the sleep! Jace is part of our Strive Kids Club and looks forward to his monthly wellness check-ups – but not as much as we look forward to seeing him! Little 10 month old Abby has already seen some drastic improvements in her sleep! Since she was born, she hadn’t been sleeping through the night and some days would get very irritable. 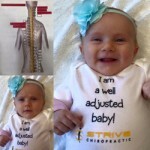 She’s doing SO MUCH better and she even took her first steps the day of her first chiropractic adjustment! We are blown away by Nicholas’ progress! This handsome little man was having a really tough time when Mom first brought him in. He was extremely irritable, crying and screaming often, wasn’t sleeping or napping, and would regularly try to hit his head against any hard surface and it was only getting worse with time. His mom said “something just wasn’t ‘right’ with her son.” His first adjustment was on a Friday and Nicholas was dropped off to spend the weekend with Grandma. Daycare’s feedback: “Nicolas has been exceptional! 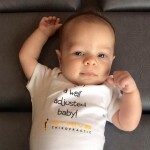 He’s taking naps, not upset and having meltdowns all the time.” One month after starting chiropractic care, we are so thankful to see a happier, healthy little boy! Taylor is 6 years old and had been having trouble focusing and concentrating in school and during gymnastics. Along with ADD symptoms, she would get irritable and anxious when she couldn’t focus or remember things. Aside from improved listening skills, less anxiousness, and better sleep, Taylor’s scans showed tremendous improvements in the function of her nerve system. She loves getting adjusted and telling us all about her day! Callie came in to the office because she couldn’t turn her head to the side. 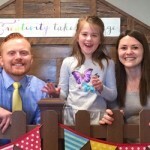 Her parents were concerned not only with the lack of mobility and the potential of having a flat spot, but the other health challenges that come with it. After one adjustment, Callie turned her head to the right for the first time as well as followed her sibling – not just with her eyes but with her head, too! She is much more comfortable and slept like crazy after her first adjustment! 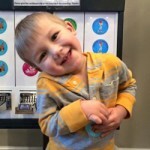 Damen was pumped to get TWO sticker tokens because he’s been doing so well with his adjustments! When he first started coming to Strive, he was having regular bed-wetting issues (almost every night). When we asked Mom and Dad how things have been going, neither could remember the last night it happened! Eight-year old Abby is quite a character and is so full of life! She was diagnosed with a super rare form of Phelan-McDermid syndrome 22q13 and a secondary diagnosis of Autism. With a wide array of multiple complications that come with both of these diagnoses, some symptoms make life way more complicated – like not being able to feel pain (no warning signs that something is wrong), developmental and speech delay, low muscle tone, and other behavioral struggles. 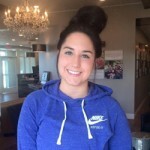 Before getting chiropractic adjustments at Strive, she had seen a plateau developmentally and was categorized as that of a 3-4 year old, was sick all the time, wasn’t sleeping well, had heightened anxiety, and was acting out behaviorally. Her speech development, concentration in school, transition skills, and body/spatial awareness have exploded! She’s sleeping better, her digestive system has improved, her immune system is stronger, and her level of independence has taken off! She’s now going through the lunch line on her own at school! This little girl is a true champion and such a blessing! 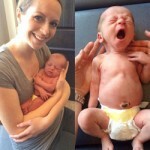 Carter came into the office with colic, gas pains, general discomfort, and trouble sleeping. You can see from the bottom scans that there was A LOT of pressure Carter’s nervous system when we first met him. Carter’s scans are now CLEAR (top scans) and he is a different baby – mom is THRILLED! After two adjustments, Lennon is now sleeping through the night and is a much happier little girl! Mom, dad, and her daycare provider have all noticed a huge change in how comfortable she seems. And we love seeing her big smiles when she comes in to get checked! Zero Complications During Labor and Delivery! 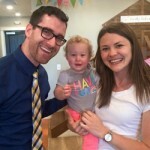 We met this new momma through a natural birthing class held at Strive Chiropractic where she learned all about things she can do to promote the healthiest pregnancy and delivery possible! 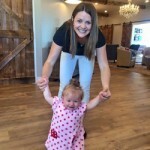 When she learned how important chiropractic was during this time for neurological development and proper pelvic positioning, she decided chiropractic was a huge importance in her birthing plan and received regular adjustments throughout the remainder of her pregnancy. Today, she shared that her experience was exactly how she had hoped and zero complications during labor and delivery! She brought in her precious 5 day old, 6 pound, incredibly handsome son, Jack, in for a check up to make sure he’s as healthy as possible! Gabe had been having a rough time controlling his temper and focusing and concentrating in school. In his words, just feeling “down and negative.” His mom shared that before trying chiropractic, they had exhausted all options for controlling his ADHD, except prescription medications. She said she had done a lot of research and just knew that they were not the answer for her son. 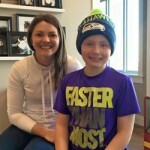 After about a month of specific chiropractic care, his mom hasn’t heard from his teacher once where normally, she said it would have been about 5 times. 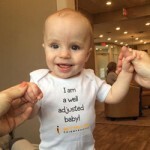 We are so happy for Gabe and we love seeing another chiropractic kid avoid becoming another statistic in the medical model! Weston is 5 years old and has been struggling with developmental delay and is on the Autism spectrum. When he first came in, he was a BUSY-BODY, going 100 mph all the time, without much eye contact or speech interaction. 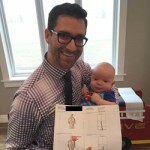 After his first couple adjustments, we asked his mom how he had been responding to the chiropractic care and she literally would not tell us. She just smiled and said, “I don’t want to jinx it.” Every time he receives his adjustment, his infectious giggling and laughter fills the room and he smiles and says, “Dr. Joe. Popcorn. Sticker.” The man knows what he wants! His mom finally gave in and shared with us that his speech has taken off, energy has slowed down, eye contact, interaction and behavior have all improved! Handsome little Jameson was brought in to Strive after Mom heard about us online. He had been so uncomfortable, colicky, and very rigid when being held. 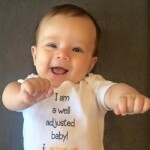 After he received his first ever chiropractic adjustment at 2 months old, mom and dad immediately noticed he wasn’t lying in a C-shaped/curved position and now he “feels like a noodle.” They’ve noticed he’s much less gassy and uncomfortable, and he’s not grunting as often in discomfort. 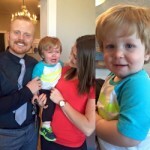 Gavin has some exciting news to share! 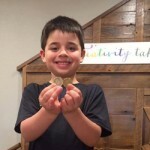 After battling 3 double ear infections and a nasty reaction to antibiotics, his mom decided to try chiropractic. Not only have the ear infections cleared up, but they cancelled his surgery to have tubes put in! The best part? 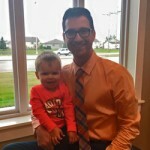 Gavin had previously failed an audiology test and was having trouble with speech development, but since adding chiropractic, Gavin’s speech “has exploded!” He went from saying single words to multi-word phrases and sentences! Clara’s mom brought her into Strive at just 4 weeks old. For the first month of life, her mom basically said she was screaming all the time. She couldn’t set her down or console her. She was colicky and stiff as a board when holding her. The top left was her nerve system scan showing tremendous amounts of stress within her nervous system. The bottom left is what Clara thought of those scans. Now she’s feeling and functioning much better, she’s much more relaxed, and mom said that she’s “not afraid her daughter is going to get kicked out of daycare for being a crab” anymore!